Are you freelancing or working from home? 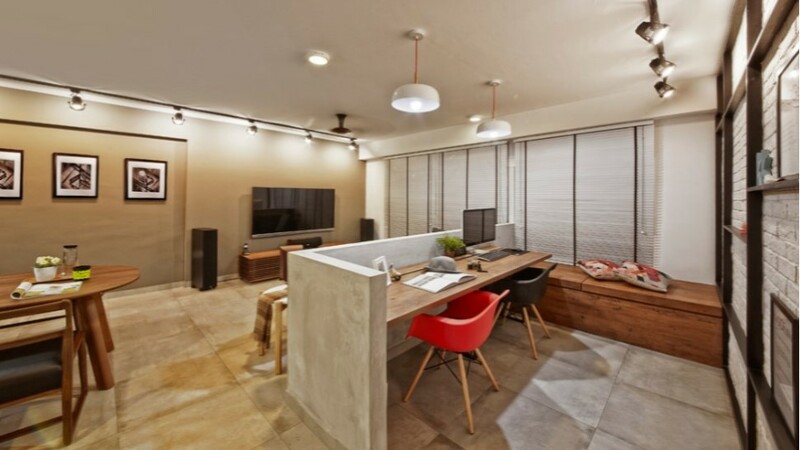 Here are some awesome ideas on how to create an efficient home office area. Anyone who spends some time working from home knows how nice it would be to have a dedicated office area, or even a hobby space. However, if you can't devote an entire room for a home office, there ar ways to fit in a workspace into other rooms in your house. It can be set up in a spare corner, a few inches off the wall, or in other unusued places you never thought to explore. But don't just place a desk and a chair in an empty corner as an afterthought. These five inspiring ideas can help you find the perfect spot for your home office and create a work area that is stylish, functional, and stimulating. A spare kitchen corner can be transformed into a double-duty work area. You could get some work done while keeping an eye on your dinner on the stove, or on your child as he does his homeowrk. Situate your desk at the end of a long counter beside the pantry so it's near, but not to close to the cooking action. 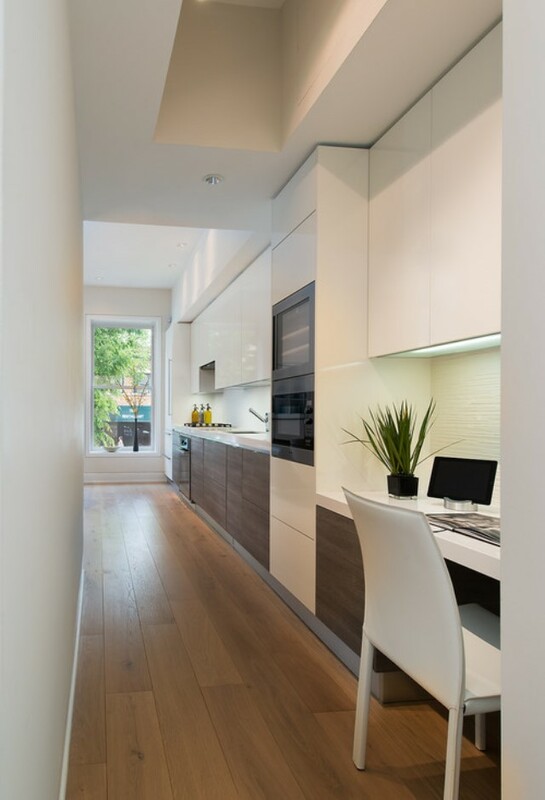 This galley kitchen has a great dead spot on one end, making for a quiet nook for sorting out bills or doing freelance work. Design-wise, use the same cabinet color and countertop material for your workspace so it will seemlessly blend in with the rest of your kitchen. Paint a chalkboard wall so your work zone can also serve as your family's central message center. 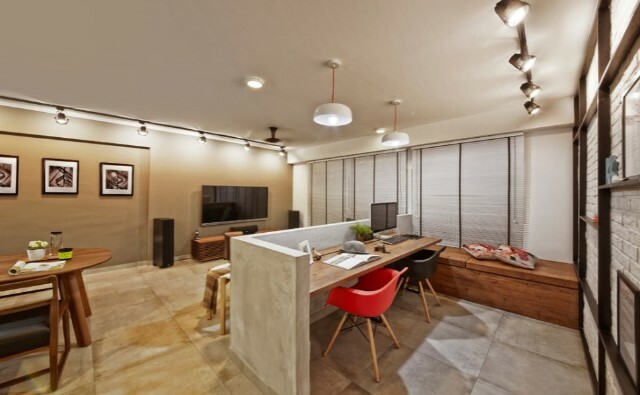 When integrating a work area in an open, multifunctional space such as the living room, make sure that your office space doesn't stick out physically or aesthetically. Use furniture and decor that fall into the rest of the room's design style, and make sure that these do not block foot traffic. One way to do this is to move the sofa to the center of the room and put a long, narrow desk behind it. In this apartment, interior designer Jann Low of The 80's Studio built a half-height concrete wall to define the study area, and placed two pendant lamps over the desk. The cozy study is physically separated from the living area, but remains visually connected to its surroundings. If you don't need much more than a writing desk, a computer, and some shelf space, then an unused corner in your walk-in-closet can certainly fit the bill. Dedicate an end part of your closet for open shelves for your books, folders, and files. Natural light spills into this walk-in-closet by Architology, so it's fitting to situate the work desk by the window area. To blend in with the rest of the space, the desk has the same laminate finish as the closet doors. An ergonomic chair and a soft rug add comfort. Another option is to create a "now-you-see-it-now-you-don't" kind of office setup in your bedroom. Fit your desk and shelves in an empty alcove or niche and hang full-length drapes, which can literally hide the entire workspace from view when not in use. Make sure to decorate the office area in a way that it coordinates with the rest of the bedroom, so that it looks good even if the drapes are drawn back. That awkward and often neglected space under the stairs can be a great spot for a compact workstation. Arrange floating shelves and a built-in desk around the available space to maximize the tiny footprint. Painting the walls in a vibrant color, such as sunny yellow or a refreshing grean, can add some punch to the space, as well as spark creativity. If you'd rather keep an overall neutral palette, use a statement chair, a cork wall, or add eye-catching artwork, instead.